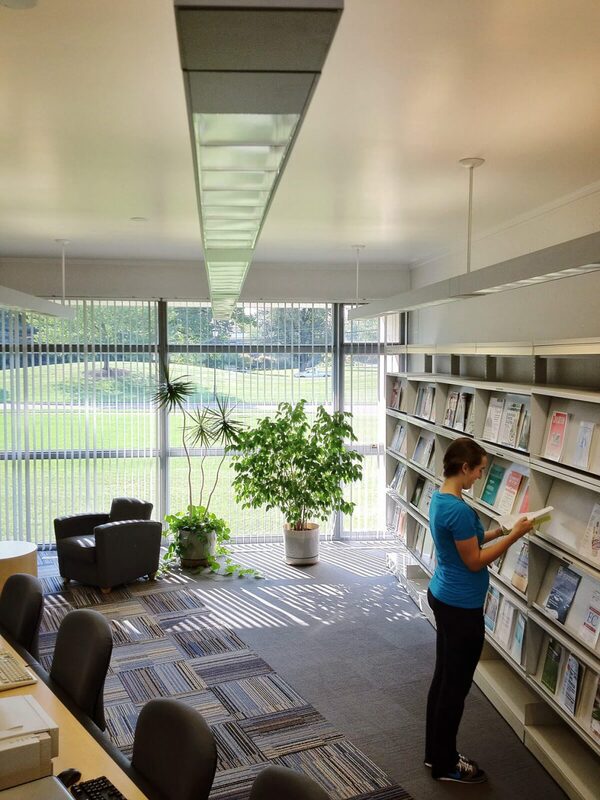 Spillman Farmer’s renovation of the Swedenborg Library, which included the addition of a technology center and a foodservice cafe, addressed Bryn Athyn’s desire to provide students and faculty with amenties beyond those of a traditional library. For many years, Spillman Farmer Architects and Bryn Athyn College have worked together to completely transform this small liberal arts college into a center for academic research and spiritual life. Spillman Farmer has completed dozens of projects with the College, and the renovation of Swedenborg Library was a crucial step in the College’s ability to reach their enrollment and research goals. The original building, like much of Bryn Athyn’s campus, was built of concrete in the late sixties. Spillman Farmer’s renovation of the Swedenborg Library, which included the addition of a technology center and a foodservice cafe, addressed Bryn Athyn’s desire to provide students and faculty with amenties beyond those of a traditional library. The Spillman Farmer leadership have always made themselves available to answer questions, attend planning sessions, and provide a sounding board to the President, Administration, and Board of Trustees.